The Dog Bone Soap Mold is perfect for cleaning up the pooch after he’s been caught digging up the garden and running through the house with muddy paws. Bar Depth: 1.125" Bar Length: 5.75"
COMMENTS: This is a great mold for my dog shampoo bars. There are only 2 bars per mold, so it would be nice if the price reflected that. Otherwise, I love it. They make fairly large bars and the shape makes them easy to hold on to when washing Fido. "adorable! This is a huge hit. big bars!" COMMENTS: All pet lovers bought this. It is a nice size cavity (2each). it held up well to hp and cp soap. Big cavities. love it! COMMENTS: Easy to unmold because of clear mold. Comfortable shape to use finished product. COMMENTS: You get 2 Huge bars from this mold, I was very surprised on the size! I made Pet Shampoo bars with this mold and it sold very fast! Glad I bought this one. "Milky Way Dog Bone Soap Mold "
COMMENTS: I used for my dog soap turned out so cute. Love Milky way molds! COMMENTS: I make CP soaps for dogs and this mold is perfect. Filled completely, it makes nice 5oz "bones." Very easy to unmold as well. Great product! "Perfect for Large Shampoo Bar"
COMMENTS: I really like this mold because most dog bone molds are small. This one is large, at almost 6 inches long. I do wish there was more than just two bones in the mold though. Another thing I like is that it is deep enough that the resulting product (shampoo bars in my case) felt solid. It didn't feel like it would break easily. I think this will be popular with pet owners. If you are thinking of making multiple bars I would recommend buying more than one mold. I wish I had! COMMENTS: Make Dog Shampoo with this mold, super cute! COMMENTS: Love the detergent free base is creamy, I think is nice for the dogs, pets in general. My finish product was wrapped in clear plastic, didn't use the cello bags, I wanted the customer to have the feel and smell of the soap more close to them, worked out good. COMMENTS: I love this mold!! I didn't know what to expect, I kinda of thought they would be a bit smaller than what they actually are. I'm mad its only two cavities,but It worked out perfect for a starter. I use these with the WSP done bone recipes and I can't stress the love I have for them and the buttermilk soap used. I will be ordering about 2 more molds to add to my pet collection. COMMENTS: I like the size of the mold for dog shampoo bars, but they can be hard to get out, but since they are the only kind I will buy more. COMMENTS: I ADORED this mold. A great size and perfect shape for doggie bars. It was super easy to get the soap out of them as well, it just took a couple days. I recommend letting it sit there for about 3 and it just pops right out. 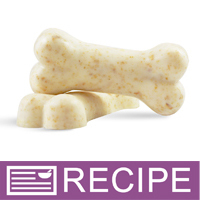 "MILKY WAY DOG BONE SOAP MOLD"
COMMENTS: GREAT GIFT FOR ANYONE THAT LOVES DOGS! LARGE SIZE DOG BONE, PERFECT! "Dog Bone Soap Mold 19"
COMMENTS: A very cute mold. We use this when we make our bar dog shampoo. Everyone loves it. The mold itself is extremely easy to use. Unmolds easily, the bars just pops right out. Washes easily, warm water. Just cute. "Not for melt and pour"
COMMENTS: I have used plastic molds for cold process on many occasions with success. Not with this mold however, despite how many times I've tried. It never hardens enough to unmold properly. Just not meant to be. I'm sure it works great with melt and pour. COMMENTS: This is a awesome mold. Very easy to use. Easy release great mold I am ordering another. COMMENTS: I love this mold, just wish you made it in silicone. Still it works great. COMMENTS: This is a very cute mold albeit a bit large IMHO. BUT I love it and can't wait to make my first pet shampoo bars with the mold. Just love it! Could also be used around Halloween for people and not just as pet soaps. COMMENTS: This mold is my favorite. I love it so much I bought three more. I can barely keep up my stock of bone soaps they are so popular. Thank you so much for your outstanding products, recipes and fast shipping. COMMENTS: This bar was a bit larger than I was expecting, but now that I've used it on my Golden Retriever, I've found the size is just right. COMMENTS: Great soap bar for the furry animals! Customers love them! "EasyTo Use Mold For Pet Soap"
COMMENTS: Easy to use, bar came right out after it had cooled to room temp. I didn't have to put in the freezer in order to remove the bar. COMMENTS: Will use to make doggie soap. It is a nice big size bar, perfect for use on the pups. "Give a Dog a Bone"
COMMENTS: Kids love this mold! COMMENTS: This mold makes a fairly large bar of soap that pops out of the mold easily. I add oat scrub to the goat's milk soap and a little bit of honey beige mica powder to give it the right coloration for a bone. It was quite an attention getter at my last craft show which is a good thing even if the customers are not in the market for "dog" soap. Anything that gets them to look at the products in your space works for me. • Smaller & 3 bones ?? COMMENTS: No bones about it! Ha! Ha! This is a fun and easy mold. If it were a real bone, my Mom's dog would have taken it for a treat. Also looks real with the right colouring. COMMENTS: This mold is the perfect size for my solid doggie shampoos. The bar is big and very easy to hold. It won't slip out of your hands when washing your dog. COMMENTS: I used this for dog soap; and everyone raved about how cute they were! "Hello, How much would you recommend charging for one bar of the bone soap? Thanks Cynthia"